WAND has recived the following information from DAIT about a new programme of courses in September (including a programme for men). Please contact dait@talktalk.net directly for more information. We are writing to let you know that we are about to deliver the Freedom Programme & Recovery Toolkit courses again, from September 2016. 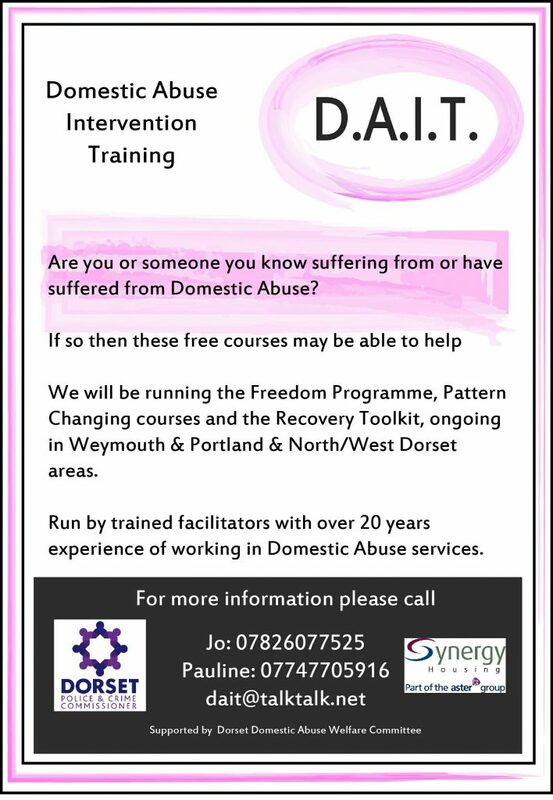 During the last two years we have delivered both of these courses in the West Dorset and Weymouth areas to both male and female victims/survivors and have had to date, 243 clients attend our courses. These courses make a real difference to victims and survivors of domestic abuse as is proven by the positive feedback we receive from both clients and agencies alike. We will be running courses in Weymouth and Dorchester starting the week commencing 12th September 2016. Freedom: This is a free 10 week course which runs for two hours once a week. This is the only course that is suitable for women who have left an abusive relationship or are still in an abusive relationship. It helps them to consider what has happened and helps women identify abusive behaviour. The course is developed so that each session stands alone and can be joined at any time. We feel the most important part of the course is that women instantly recognise that they are not alone. The most common held belief amongst victims is that they hold some responsibility for perpetrator’s behaviour and the course is designed to clearly identify that this is not the case. The strength comes from the group and can be very powerful in helping clients recognise that abuse is wrong on every level. There is a book that accompanies the course which every participant receives. There is very little writing during the course and is accessible for any ability. Recovery Toolkit: This course is a Trauma Focused Cognitive Behavioural Therapy programme based on guidelines set by NICE (National Institute for Clinical Excellence) for treating Post Traumatic Stress Disorder Type 2 often experienced by domestic abuse victims, running over 12 weeks. This course is suitable for men or women who are not currently in an abusive relationship but have previously experienced domestic abuse. The aim of the course is to empower clients with lifelong skills, tools and techniques to effectively make healthy choices for their future. Why run both courses? It is a misconception that those who experience abusive relationships understand what they are going through; Freedom helps participants to recognise domestic abuse and identify all the tactics used by perpetrators. The Recovery Toolkit looks at domestic abuse from a different angle and helps to develop self-esteem and confidence. The two courses together are extremely powerful; we recommend that women should complete Freedom Programme and then go onto Recovery Toolkit. Acceptance on to the courses will be made on a satisfactory risk assessment made by DAIT staff on the client’s suitability for group work and their current situation. We would be pleased if you could share this information with your colleagues and display the enclosed poster. (The posters are particularly effective if displayed on the back of toilet doors.) If you do wish to make a referral please use the attached form, give us a call or email and we can send the referral form electronically. Clients can refer themselves by calling the numbers below. We would be more than happy to attend your team meetings/training to explain the courses further. This entry was posted in Activity and tagged DAIT Courses on July 3, 2016 by mariac.